Mark Rogers of MarkRogersTV invited me on his show this week to debate what the ideal NCAA football playoff would look like. I argued that the new four-team playoff system going into effect next year is the best format, and it’ll be the best postseason in all of sports. Mark Rogers argued for a 16-team playoff that includes all 10 conference champions plus six at large teams (conceptually similar to March Madness). The full video is 25 minutes long so I’ve included time stamps below so you can jump to the points that interest you most. 2:50 Mark details 16-team playoff format. 4:05 Mark explains NCAA formulaic non-conference scheduling. 5:15 Ryan argues against NCAA controlled non-conference scheduling. 10:00 Are fans losers with bad playoff matchups? 11:30 Mark lists hypothetical playoff matchups for 2013. 12:47 Would a large playoff doesn’t reward body of work? 14:35 Would a large playoff ask too much (17 maximum games) of unpaid student athletes? 16:10 Are fans the losers with four weeks of playoff scheduling? 16:30 Does a four-team playoff cover all the bases? 21:55 Mark draws up hypothetical 2013 4-team playoff. 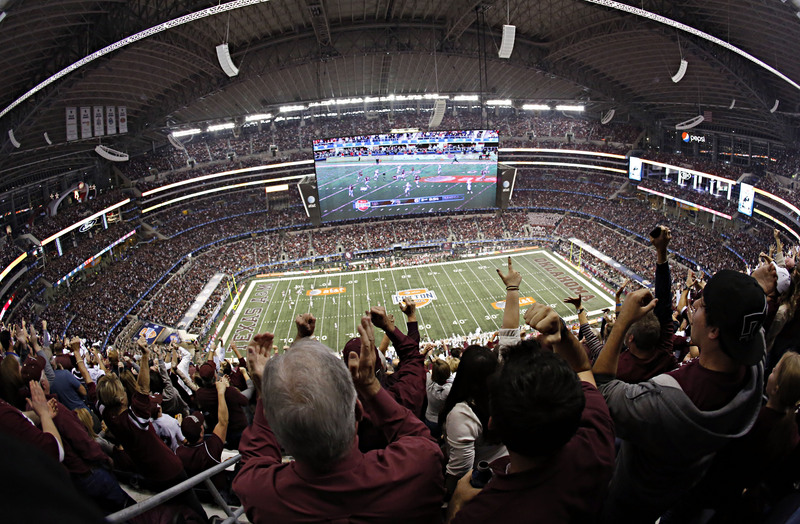 The first National Championship under the new four-team playoff format will be hosted in Dallas, TX.